Water Leaks and Leak Detection - Ewell Construction Inc.
For more than 40 years, Ewell Construction has been a leader in the advancement of waterproofing technologies and solutions. We combine innovative technologies and time-tested products to provide reliable waterproofing solutions for virtually all above grade and sub grade applications. Call us at the first sign of a problem and we will not only find the leak, but we will identify the best way to fix it, guaranteed. 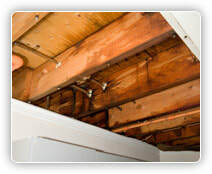 With our crew’s expertise in this area, we find all kinds of concealed leaks. Ewell Constructions high quality polyurethane products such as Polytuff Flexideck P-A ® are the basis for quality water proofing, helping to protect your home, deck or roof from the damaging effect of water. We ensure that our team will do the best job in protecting your home. ​We will come out to your building to find your leak and identify the best solution to fix it. In addition to finding your leak we can provide you with the best waterproofing solutions for virtually all above grade and sub grade applications. We use only the highest quality products, such as Polytuff Flexideck and Sur-Flex to protect your home, deck and roof from water damage.